My Great grandparents were both miners at Glapwell and Unstone Colliery. I am now living in San Diego, CA, I was showing my Dad your site and made the request if you could add the following. His Grandad Thomas Henry Mullins died at Glapwell on 22 February, 1935 (he was walking out and forget something ran back and then there was a pit collapse and he was dead by the time he was dug out). If you could add this death to the death/accident section, that would be much appreciated. 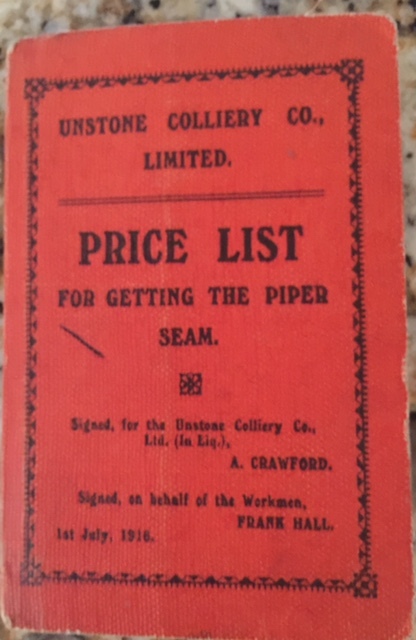 Also, I have my Mum's Grandad's Fred Jackson paybook from 1916 from Unstone Colliery. I have attached a scan so you can add this to the website, please feel free to add to the site. Thomas Henry Mullins was 37 when he died and Fred Jackson died at 60 (Fred was still a miner when he died). 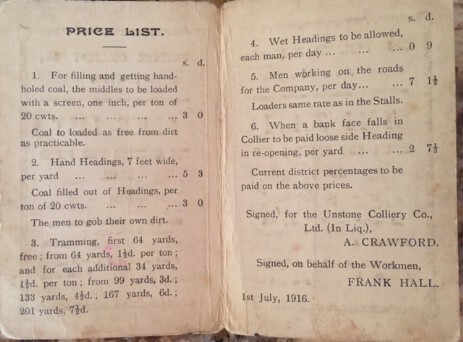 If its not too much trouble if you do upload the Unstone Mine Pay book if you could add in memory of Thomas Henry Mullins and Fred Jackson (ironically they both knew each other) and my Nan (Fred daughter is still alive 92 and living in Unstone, this would mean the world to her). Great site and Happy New Year! PS: My parents live in Chesterfield, but I grew up in Summerley. Many thanks for the information and the paybook, Matt.